The most common type of hernia is an inguinal hernia in which a small portion of the intestine protrudes through the body wall at a point where the abdominal muscles are weak. An inguinal hernia is particularly common in men and boys; it can even be present in baby boys at birth. In older men, a hernia can develop as a result of straining the body by lifting heavy objects but it is also much more likely in men who are obese. The hernia causes a lump to appear, which can be uncomfortable. A hernia repair is a relatively minor operation but it is important to carry it out sooner rather than later to prevent the hernia causing serious health problems. It is possible for the part of the intestine that is poking through to become constricted or twisted so that its blood supply is cut off. When this happens, that part of the intestine starts to die and this can lead to a serious infection such as gangrene or peritonitis. A hernia repair is usually done as an outpatient procedure but it does require a general anaesthetic. Someone undergoing this operation is therefore not required to spend the night in hospital, but they must be driven home by a friend or relative as they may be a little groggy for a few hours afterwards. The operation itself involves making only one incision about 10 centimetres long (4 inches) at the most at the fold in the groin. The protruding intestine is eased back into the correct place and a specially designed mesh is placed over the weakness in the body wall to prevent it popping out again. 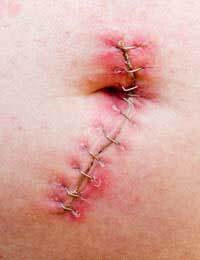 The incision is closed with stitches that dissolve over the next few weeks but the mesh does not dissolve. It becomes a permanent fixed support inside the body. There are two methods that are commonly used to repair a hernia using keyhole techniques. These are less invasive and do not require the 10 cm incision used in traditional hernia repair surgery. Three small incisions of two centimetres at the most are used to guide the instruments that push back the protruding intestine and insert the mesh. One of the incisions is used to introduce a laparoscope, a camera on a slender tube that transmits pictures to a computer screen so that the surgeon can see exactly what he or she is doing. Recovery from a keyhole hernia repair usually takes less time but it is important to keep the wound clean and to avoid straining until the area has healed. For the first couple of days, you may need to take some pain relief such as paracetamol or paracetamol with codeine or ibuprofen as the site of the incisions will be sore. After resting for about three days, it will be possible to carry on with normal life as long as you don't do anything too strenuous. It is important to listen to your body and be sensible. As the stitches used are dissolvable, you don't need to return to have them taken out but you will be given another appointment for a check up. After the immediate pain of the operation has worn off you may find that you still have vague discomfort in the area of the groin but this should gradually reduce over the coming weeks. Most surgeons recommend that you eat a high fibre diet and drink plenty of water to avoid constipation, which can strain the repair. Most hernia repairs are very successful and you will be completely recovered within about 2 months. Immediate side effects usually arise from the anaesthetic and you may feel or be sick as you come round. Some people also experience more swelling at the site of the operation than others and have difficulty passing water, some pain or numbness or even swelling of the scrotum. More serious complications can occur; you may have a lot of bleeding, and the blood can persist at the operation site. Removing the excess fluid becomes necessary in some cases. Rarely, a nerve is damaged or irritated during the operation and this causes long-term pain or numbness and may need further surgery to remove pressure or rescue a trapped nerve. Can a Hernia Come Back? With modern hernia repair surgery, it is rare for the hernia to recur as the mesh holds the body wall together very successfully. However, it is possible for the intestines to protrude through an adjacent area of body wall, causing a new hernia. If someone who is very overweight develops one hernia, they are more prone to developing further problems if they do not lose their excess fat.